VALUE PACK: It is made of high quality paper which is environmentally friendly. It is a birthday party decoration set that can be used immediately, and includes various party decorating items, it is a super luxurious birthday decoration set. 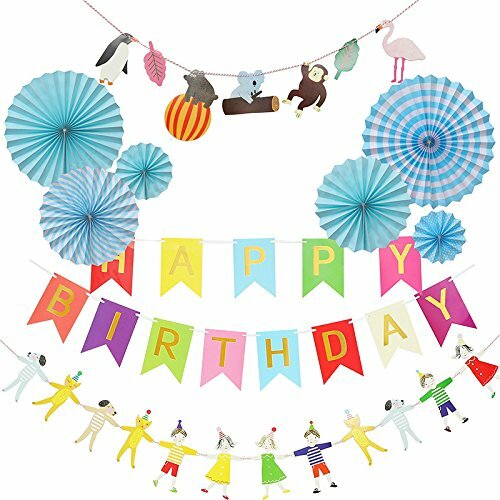 HAPPY BIRTHDAY BANNER: Banners are made of high quality paper, and it is specially designed for girl or boy birthday party decoration, hoping your family, friends and you have a good birthday party. DIY REQUIRED: It's not only birthday party decorations, but also a chance to enjoy this special moment with your kids. When you prepare this birthday party together, he will feel he is also an important member of this event.